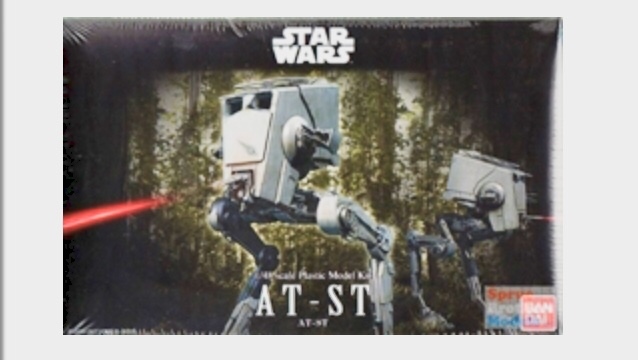 Hello everybody ... Well I decided i couldn't wait to start my Bandai AT-ST Walker. Being that im coming from an Aircraft modeling base i have loads of extras in 1/48 scale. My intentions are to build this as a Resistance captured/operated walker. Ive chosen to build it as a Temperate/Junglie L.R.R.P. Unit. This will have extra weapons possibly uprated armor, stowage, and a nice Camouflage scheme over everything. Something like the scheme #’s 7, 9, & 10 from @Gekko_1‘s walker thread. Im hoping Gekko you dont mind me linking to this ? I take inspiration from several other builds of Star Wars models not just walker’s. I have thank @Gekko_1, @AndyRM101, @monsterpartyhat, & @Pete in Lincs all your sci-fi works have inspired me to do this. I was able to build up the Hip section ? And some of one leg today. As you can see i added some wire bundles in the recess, it seemed a bit bare in there. Heres the leg next to it. I will finish the two legs and head in stages. Then before attaching everything i will paint the overall camouflage. Thats the plan for now. These thing go together easily and quickly so i dont see this being a long drawn out build. Darn it if these kits aren't super addictive. I went back at it a couple hours ago and finished the one leg. Started the second one and left off about half way. The first leg had some issues that were my fault as i had glued some of the seams together. Turns out capillary action froze the ankle, so i had to really shave and chop my way to mounting the foot. I will freeze the other ankle so at least it wont give it an awkward stance. Questions, comments, or jokes ? Great start Dennis. I like the extra detailing you've added to the mid section. One word of advice; where possible, it's a good idea to lightly ream out the holes for the connection pins. Doing so lessens the tight fit and removes the tension that some of the parts are under. I agree they are addictive, picked up two before Christmas. I personally like scheme 10, though I think it would be difficult to paint, IMHO. I plan on scheme 23 and shedder myself. Look forward to seeing your changes. I've got one of these and an MPC version to build side by side. Good luck with this one, Dennis. Looks very good im looking forward to seeing yours built up. That should be an interesting build with both next to eachother. Thanks for the well wishes. Im hoping Gekko you dont mind me linking to this ? One thing to warn you about though! DO NOT use any Enamel based washes on a Bandai kit! The Enamel wash will eat into the Bandai plastic and destroy your joints. Its happened to me on my AT-ST and Slave 1. Yes ive seen and read about the enamel washes. Does that hold true for enamel paints ? I can go all acrylic but was considering Black-basing the scheme and the only black i have is enamel ? Hello everybody ... I did say these were addictive didn't i ? I was able to finish the Legs today and mocked the walker from the hips down. It seems a bit tail heavy and wants to flop backwards currently ? Im hoping once the head, weapons, & stowage are mounted and the head is forward it will stand on its own ? I was looking at the feet as i was building the legs. They're smooth which just doesn't seem correct. Not for a vehicle thats supposedly all terrain. Designed to be able to grip different surfaces and inclines. So i will grove and score the feet in a off road/all terrain pattern much like a military tire. Next up was the cockpit, i removed the little box structures on the seats as im not using the imperial drivers. I may add some platform for a driver to stand in the hatch or maybe a ladder ? Seatbelts will be added tomorrow. No im not using the painting guide that comes with the kit. Im going with what i like and think looks good. I mounted the pieces together and started painting the dash board. I will give everything a wash and post photo’s of that tomorrow. Questions, comments, or jokes ? Hello everyone ... Well I got some good stuff accomplished today. I finished up the Dash in the walker and mounted it. Next up i finished off the head of the walker. I started adding some extras as well. The smoke/chemical dischargers on the temples came from a 1/35 Tamiya Tiger. I noticed after building the main armament turret that with the cheek armor design. The turret has a limited traverse left to right and slightly up. I removed some of the front cheek armor and tested the traverse. Currently it has improved so im happy. Starboard view shows the new main sensor tower. In its former life a 1/48 Pave spike pod. I'm thinking of some form of optical sensors or a maybe a radar of some sort, any ideas ? The rear face shows a stowage rack from a 1/35th sherman. This will be covered with boxes, water cans, and the crews packs. Below that i added some breather filters for hostile environments, formerly 1/48 sherman air cleaners. The barrel swab is a secondary sensor antenna. I built up the top as well but i have a couple of things to add to it. However i have decided to modify it so i can remove it freely after im done for display. The two holes drilled on the port side are for commo antennas and i may add a few whisker antennas for other sensors. Seems a shame to hide the detailed interior. I have a few things to add after i paint. Such as the weapons, both the main turret and the secondary weapons. Though for all intents and purposes, i can start painting this pretty soon. There is very few gaps anywhere and the few that exist are hidden in limited access areas. Thats a tribute to the good design from Bandai. Any suggestions are welcome as are questions, comments, and or jokes. So I built a searchlight and mocked it on the model. Doesn't look to bad does it ? Still needs a piece of clear lense over the inner-bulb. I added an anti-personnel/AA Gun on the Turret ring as well. Thats all i was able to get done tonight. Tomorrow is the once over and prep for paint. I need to pick out the colors out yet. More tomorrow or Sunday. Questions, coments, or jokes ? I would add the searchlight under the nose guns. Off to the side has a better chance of being knocked off and you limit the light to the other side. With under the front guns you have maximum light area plus the guns are already pointed to where you are looking. My $0.02 anyway. Oooooooo, Star Wars modding, love it. Looking good so far dude. under the front guns you have maximum light﻿﻿ ﻿area plus the guns are already pointed to w﻿﻿﻿﻿here you are looking. My $0.02 anyway. Thank you thats not a bad idea at all, i will do some mocking up to see if it will fit/work in this configuration ? Thank you. Like the camouflage on yours. Is that one of the 1/48 kits or a war gaming piece ? Its hard to judge scale in your photo ? It’s the small one that comes with the snowspeeder, kit 008. Just bodged some random Humbrol paints on with the hairy stick. The decal is from an Italian 144 scale typhoon. Hello everybody ... Well i went with @Tank1812‘s suggestion. I modified my light and added it to the lower side of the main turret. Though this walkers main function is intelligence gathering not assault. It does have that capability. I then did some more work. I added a couple of blaster hits to the walker one on the face, and another on the port side. I decided to add some periscopes (1/35 sherman) to the top deck just inside the railing. After all the real deal in the movies had them. Here you can clearly see the one in use in the ESB walker attack on Hoth. Portside up and open, starboard side down and closed. You can also see the stowage mounted. Its easier to paint it after the camouflage has been done. Rather than trying to glue onto paint ? Better look at the anti infantry/AA gun mounted on the turret ring. Though its only mocked up for now. Heres the port side showing the other blaster hit. A better look at the stowage. And a close up of the secondary weapons. I originally painted these black but they didnt loock right. So i repainted them traditional grey. I think im ready to set-up for paint so its pick my colors and decide on a pattern ? As usual questions, comments, or jokes ? Liking your plan. I would move the machine gun further out in the mount so it doesn't interfere with the hatch movement. The mount is in a good spot. Maybe create a U cradle (similar to the Sherman .50 cal) for the gun and then attach that to the mount. You talked about a ladder or similar in the hatch. I have thought about @AndyRm101 "roll bar" but not that good, I have planned for a simple post with foot pegs that would rise and lower with the hatch movement. One of the other things I have thought about with mine builds, if the mission changes like here the side weapons, would probably change. You can even go a step further, true recon would have probably dropped the main blasters in the nose. So the light would go in that spot and not be a candle light but an "infrared spotting light". There is still the small "spotting guns" that could be used for anti personal action. Wouldn't need the grenade launcher, but maybe a second blaster cannon on the side or something similar. Anyway that was my thoughts, you tell the story how you choose. Yes ive seen and read about the enamel washes. Does that hold true for enamel paints ? I can go all acrylic but was cansidering Black-basing the scheme and the only black i have is enamel ? Hello everyone ... So i was looking at my walker, two things kept bothering me ? The first was the big empty wall that is the left side of the head, its just to plain. The second thing was something ive noted in a lot of online walker builds. On a base either Imperial or Resistance. I imagine they would have the facilities to just clamber aboard. However in the field how do they mount/dismount from a walker ? So it struck me to build in some steps/ladder. I found some odds & ends to make something up. There are steps up the port leg. They're the tan colored bits. And for the transition a stowable compression ladder mounted under the head. That fills the side up nicely and solves a problem. Now the drivers can dismount in the field to use the . Paint is next i think ? I feel good with where its sitting. Thats when i dont want to add anymore ? Questions, comments, and jokes ? The steps are something I'd always wondered about. On one of my walkers I fitted a SAR type winch. I actually considered that and built one. While i was trying to mock it up and find a suitable location to mount it. I just couldn't find a spot that worked out for me. A rope ladder off the rear engine and a few hand holds on the rear of the head would be my thought. Hey everyone ... I was able to spray the colors finally. I chose to blend two of @Gekko_1‘s camouflage schemes #’s 7 & 9. I worked over two sessions, two days, & four colors. The colors were a Tamiya deck tan as a base. Followed by Ammo by Mig APC Interior grey/green(sickly looking color) striping, looks like a grey with my lighting ? Then a Vallejo medium green mix & Vallejo German Black/Brown for stripes and blobs. I will need to trim down the ladder and paint the connecting bubble/spine. You can see i decided to add a commanders seat when i did the steps/ladder. Just visible through the upper hatch. It also still needs to be painted. I will need to do some detail painting like the grills and such. I also need to add a few minor things, like some of the hoses under the head. Hope it looks ok, questions, comments, or jokes ?